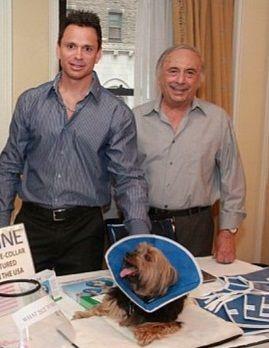 Albert and Steve Benbaset of Trimline, Inc.
Trimline canine recovery collars offer a comfortable alternative to the old-fashioned, plastic Elizabethan dog collars. If you don't know what vets use recovery collars for or you want something better than the plastic "lampshade," learn more about these flexible cloth collars in this interview. Trimline Inc., located in Boca Raton, Florida, manufactures a soft, fabric recovery collar that is a superior choice over the plastic recovery collars you have seen so often. This collar is flexible and washable, which makes it easier to use and more comfortable for your dog. Trimline's collars come in five sizes so you can get one for any size dog (or even your cat!). To learn more about these collars, LoveToKnow spoke with Albert and Steve Benbasat, co-owners of Trimline, Inc. Albert and Steve have an extensive background in textiles, which gives them the resources to design a soft yet effective recovery collar. Their inspiration came from hearing about someone whose cat suffered abrasions as well as trauma from wearing a plastic Elizabethan collar after getting caught in a railing. This prompted the Benbasats to create a softer, safer alternate. LoveToKnow (LTK): Can you explain the purpose of a recovery collar? Albert and Steve Benbasat (A&S): When your dog or cat is injured and on his or her way to recovery, a recovery collar is needed. After a surgery, especially a spay or neuter surgery or an injury on your pet, your vet will issue out an E-collar. The Trimline Veterinary Recovery Collar is a soft, lightweight and flexible Elizabethan-style collar that provides a barrier to the treatment area that prevents licking and biting while still allowing pets to move around comfortably and easily. It is available in five different sizes and features a drawstring neckline to ensure a comfortable fit for any pet. LTK: Are recovery collars only useful for wound healing? A&S: Recovery collars are primarily useful for healing wounds and preventing a pet from accessing or scratching at the area. For example, if the pet has an eye injury, you want to prevent him from scratching the eye further with his paw. If the pet had a leg surgery, you want to prevent him from biting, chewing or gnawing at the bandage in order for it to heal properly. Although it is most effective during the recovery period following surgery or injury, the Trimline Collar can also serve as a great tool for groomers to use when powdering, spraying, bathing, cutting nails and brushing teeth. LTK: How long can a dog wear a recovery collar? A&S: The Trimline Collar, or the "soft, blue collar" is flexible, which allows the pet to move freely and eat, drink, walk, sleep and even play while wearing one. This being said, pets can wear the collar 24 hours a day until they have properly healed from their injuries. We find a very high user compliance with pet parents who opt to use the Trimline Collar on their pet compared to more uncomfortable alternatives. When wearing the Trimline collar, a pet doesn't bang into furniture or get stuck, which makes it a safe option whether you are home or away. Plus, our collar is machine washable, so if it gets dirty, you can just wash it and put it back on your pet. LTK: What are some potential problems with using a recovery collar? A&S: Sizing. The most important factor with the Trimline Recovery Collar is making sure that the sides of the collar reach past the dog's snout. It has less to do with the neck size, and more to do with the reach of the nose. The collar is most effective when it blocks the pet's nose and mouth from reaching the target area. LTK: How can pet owners help their dogs adjust to wearing these collars? A&S: Positive reinforcement is a strategy I like to use in any training or behavior situation. While dogs or cats are recovering, make sure they feel as comfortable as possible. You never want to make them feel like they are being punished. LTK: What are the benefits of a flexible cloth collar and is it as effective as a plastic Elizabethan collar? A&S: Unlike the old style, rigid plastic E-collars, these soft e-collars won't hamper your pet's peripheral vision, they won't cause damage to your walls, and they will not frustrate your pet. They are also much lighter in weight (which is easier on your pet's neck and spine) and more comfortable for our four-legged friends. Unlike the hard collars, the soft E-collar actually lets your pet recover in total comfort. LTK: Where can people find your collars? A&S: The Trimline Veterinary Recovery Collar is available at all veterinary distributors. Just ask for the blue, soft collar and help ease your pet's pain and hasten his recovery. It is completely manufactured in the USA from a specially designed, laminated fabric that is non-allergenic, non-toxic and water resistant. Learn more about this patented pet product at TrimlineInc.com. LoveToKnow would like to thank Albert and Steve Benbasat for their time. To learn more about the recovery collar that is best for your dog, talk to your veterinarian. You can purchase a Trimline collar from your vet, or you can contact Trimline directly to find out about their retail pricing.